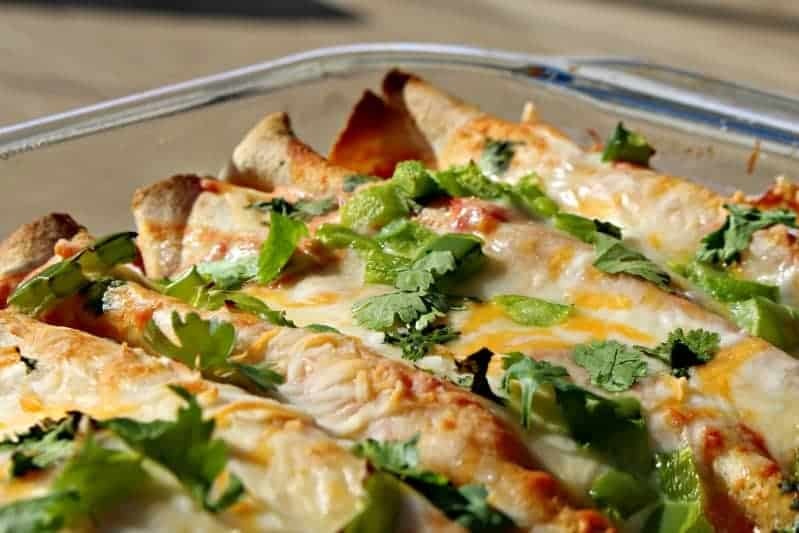 If you’re not sure what to make for dinner tonight, or just don’t have a lot of time to spend cooking tonight, this Chicken Enchiladas Recipe should definitely be added to your go-to weeknight dinner rotation. It’s a great crowd pleaser and can be made gluten-free (I used Toufayan Gluten Free Tortillas for the ones pictured below, but you can use any big tortilla you have. I also used white rice flour for the sauce). I also strongly recommend using a brand called Better Than Bouillon, this is my all-time favorite broth base. I switched most of my recipes to this and it definitely made a positive difference in flavor. Chicken smothered in cheese and spices, wrapped in a tortilla and baked to perfection! 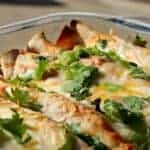 Easy to follow recipe for chicken enchiladas. Serve these with avocado, sour cream or salsa. Heat olive oil in a sauté pan over medium heat. Add chicken and cook until chicken is just cooked through and no longer pink. Remove chicken from pan and set aside. Add onion and bell pepper to sauté pan and cook until soft, about 5 minutes. Add chicken, bell pepper, onion and 1 tbsp of shredded cheese to each tortilla, dividing evenly. Roll each enchilada around filling and place with seams facing down in an 8x10 greased baking dish. Add butter to sauté pan over medium-high heat. When butter melts, add flour and stir until flour is mixed in. Slowly stir in broth. Add garlic, cumin, cayenne pepper, salt and black pepper. Add diced tomatoes with chiles and stir until all ingredients are combined. Remove from heat once this comes to a boil. Add greek yogurt and stir until evenly combined with sauce. Pour sauce over the top of the enchiladas. Add remaining shredded cheese to top of enchiladas. Bake enchiladas for 20-25 minutes at 400°F, or until cheese is melted and top of enchiladas look toasted.